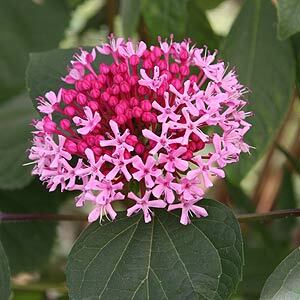 With large foliage and attractive pink and red flowers Clerodendrum bungei is an excellent plant dry shade. The individual starry flowers appear in large clusters to form a very attractive flower head. The open flowers being a pale lipstick pink, the buds waiting to open a deeper pink, creating a great contrast. It is a suckering plant and will spread by underground runners, however it is easily controlled. Clerodendrum bungei is also commonly known as the ‘Rose Glory Bower’. The flowers appear in summer and provide good color in shades areas, sweetly scented, unlike the foliage which has slightly rubbery or metallic odour, but only if you rub them. Foliage is a nice deep green and has a red tinge to the underside. Useful in landscaping for planting in dry shade beneath deciduous trees. This is an easy care plant in reasonable soil. It will sucker, however is easily contained with a little digging up of the suckers each year. A well drained soil and dappled shade is essential. Clerodendrum bungei can be pruned back hard, almost to ground level each winter. This practice ensures masses of flowers the next summer. Propagation is easy by division of clumps or separation of suckers, also from cuttings and from seed.